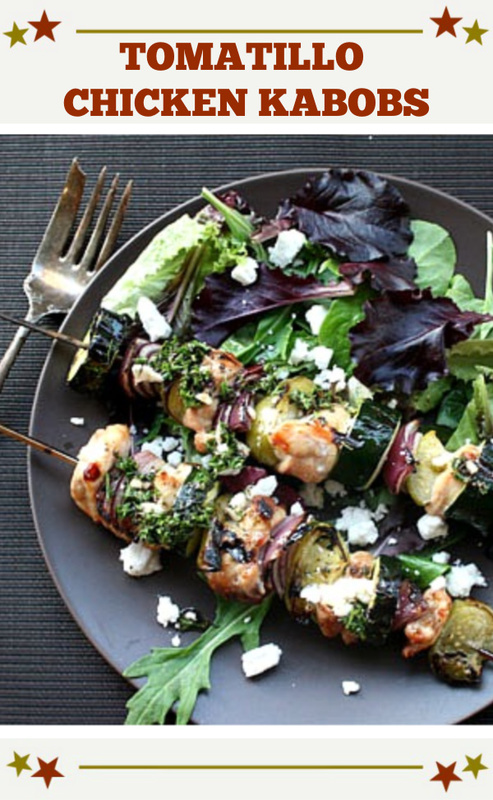 Grilled Chicken Skewers with Tomatillos. There’s a surprise in every bite of these beautiful chicken kabobs. Predictable with Zucchini and onion, these are made special with a unique vinaigrette and zesty tomatillos. Grilled Chicken Skewers with Tomatillos and Mint Vinaigrette will be a hit for your next cook-out. This recipe comes together nicely dressed with a mint vinaigrette made with red wine vinegar and parsley. Not only does it compliment the smoky flavor of the grilled chicken but is beautiful for those tangy tomatillos. Served over beautiful mixed greens and sprinkled with salty feta this is a healthy meal and a beautiful flavor combination. And one that’s ready in a jiff. It doesn’t get any better than that. This actually has been our go-to easy Summer chicken grilling recipe. It’s just that easy and that delicious. I hope you give these grilled chicken skewers recipe a try. And if you do, please come back and let me know how you liked it and give the recipe a star rating. Your feedback is valuable to me for developing future recipes. And if you have a favorite Southwestern grilled chicken skewer recipe, let me know, I’d love to give it a try. Don’t forget to pour a nice glass of wine. Always a sucker for Oregon wine, we enjoyed these with a tasty Oregon A to Z Pinot Gris . 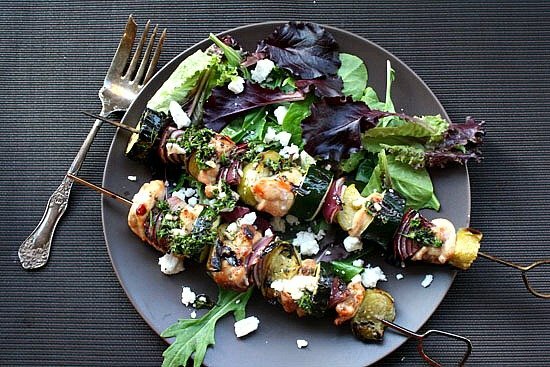 Healthy, easy, chicken skewers are predictable with onion and zucchini, with a surprise bite of tomatillo. These chicken kabobs on the grill are a great idea for your bbq dinner, or outdoor grill party. Easy enough for a weeknight dinner. This Mexican chicken Kabob Recipe is a party pleaser. Preheat grill. Peel and rinse tomatillo and prepare other vegetables and chicken. 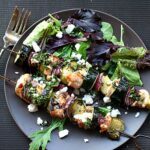 On four 14-inch-long metal skewers, tightly thread the chicken, zucchini, red onion and tomatillos in an alternating pattern. Brush the skewers with 1 tablespoon of the olive oil and season with salt and pepper. Grill the skewers over a medium-hot fire, turning frequently, until the chicken is just cooked through and the vegetables are lightly charred and barely tender, about 6 minutes per side. Meanwhile, in a small bowl, combine the mint, parsley, garlic, vinegar and the remaining 2 tablespoons of olive oil; season with salt and pepper. Serve over mixed greens. Spoon the vinaigrette on top, sprinkle with feta. Looking for more ways to use Tomatillos? 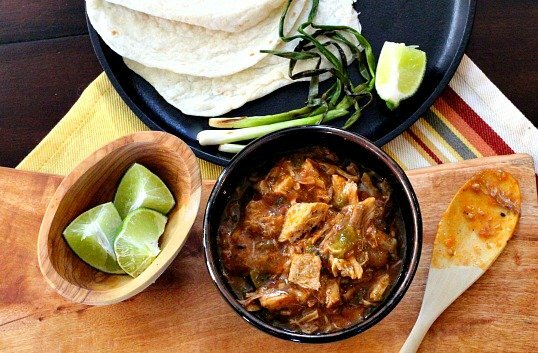 Make a fresh recipe of Homemade Roasted Tomatillo Salsa. It’s easy and your chips will be very happy. MMM I bet that was good! 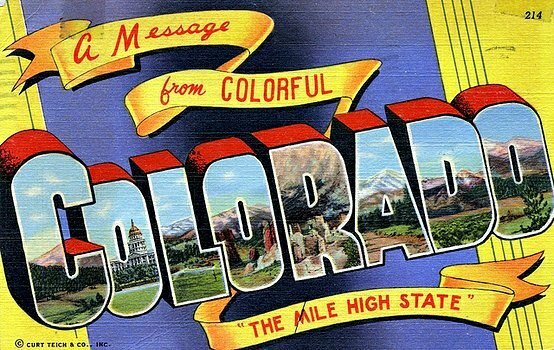 Thanks for stopping by my blog LeAnn.